I don’t know anyone there. I don’t know the language. What about this Zika virus? What about this political unrest? These were some of the doubts and fears racing through my mind at the start of my trip. I had barely settled back home from my trip from PyCon US when it was time to start making the trip to Python Nordeste. It’s a long set of flights to Teresina in the northeast region of Brazil, and I was alone. Those doubts vanished in almost an instant as I came off the plane to find many of the conference organizers there to greet me. 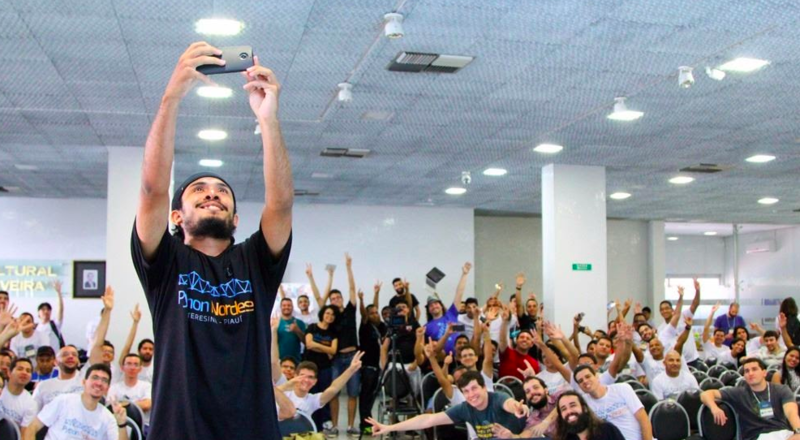 From that moment I found that the Python community I’ve come to know and love so well, the community which has always been so warm and welcoming, is alive and well in Brazil. I had been asked months before to come and deliver a keynote at Python Nordeste 2016, which was now in its fourth year. The organizers explained their mission was to have a conference catering to the poorer northeast region of Brazil where many cannot afford to attend the larger PyCon Brazil, much less conferences outside of the country. I care about the diversity of voices in the Python community and reaching out to underrepresented groups so this mission spoke to me. I worked with them and with people at Caktus to make it possible to attend and speak. I thought about what I wanted to speak about for a long time. I didn’t know what they wanted or expected from me when they had asked me to speak. Should I give a technical talk on Python or Django? Should I try to inspire or motivate? Finally I set out on a single goal for my talk: to give a talk which only I could give. I wanted to share a piece of myself and my experience as a developer. The more I thought about it, the more I kept coming back to this idea of how my love of running has shaped my approach to development. The conference itself was three days. The first day was a set of tutorials followed by two days of talks. My keynote was set for just after lunch on the first day of talks. Since the tutorials were in Portuguese, I decided to take that first day to explore the city as well as continue to prepare my talk for the next day. I explored a local market full of artisan sellers. I walked up one of the main streets and saw the local shops, restaurants, and people going to work and school. It was hot and humid walk. The feeling was similar to our summers in North Carolina but it was winter there. The buildings were short, only a few stories tall. Many open air spaces likely due to the warm climate. This was my first experience with a single track conference format, and overall I liked that everyone saw the same content. It also allowed for questions to run a little bit over which they did several times during the course of the two days. While the talks themselves, other than mine, were in Portuguese, I was able to follow slides with code samples or project demonstrations. When it came time for my talk, I was nervous but ready. I talked about my love of running, sharing pictures from various races. I talked about how getting better as a runner requires a long view. Progress is slow and it comes from consistency over time rather than big efforts all at once. That’s been my approach to improving as a developer as well. It’s based on steady and focused improvement. My running is focused on being better than myself rather than judging my success versus the ability or accomplishments of others and I bring that same mentality when working on my programming skills. Unfortunately my talk could not be translated into Portuguese live due to the cost, and I’m sure that left some excluded. I received some positive reactions to my talk. One of the organizers, Francisco Fernandes, in particular shared how my talk related to his experience in graduate school and how it had touched him. In the end I felt I had met my goal and delivered a talk that was genuinely me and that made the long trip worth it. As luck would have it, the Olympic torch was being carried through the city that night, and I had the opportunity to go see it and run alongside it for a brief period. I grew up swimming and always loved watching the summer Olympics. I never dreamed that I would come so close to the torch. 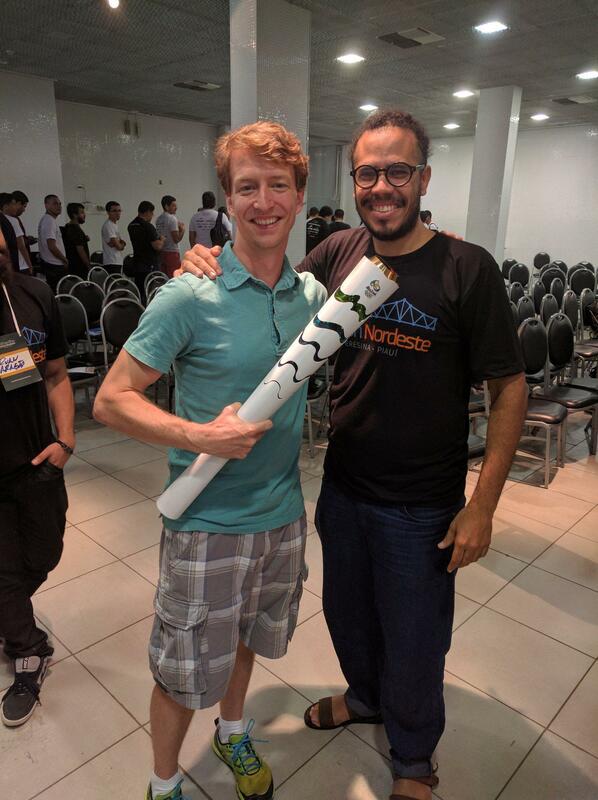 Francisco had a connection with one of the torch bearers and brought it to the conference for the second day of talks allowing people to have their picture taken with it. It felt like a once in lifetime experience. The second day featured a number of talks which stirred a large amount of debate from the audience. Questions pushed well outside the original time and the schedule fell behind. Everyone seemed comfortable with adjusting as needed. While the final lightning talks were eventually lost due to the additional time, there was a great effort to have a round-table discussion about the state of women in technology in their community. There were roughly a dozen women in attendance, less than 10%, and no women speakers. The organizers gave those that wanted an opportunity to speak about their experiences and some of the other attendees responded with questions or their own experiences. I was thankful to have people in the audience willing to translate for me so that I could keep up with the conversation. I hope this leads to more inclusion efforts in their community. After the conference ended I had the chance to visit a local hackerspace before continuing to a post-conference celebration. My first trip to Brazil was an absolutely amazing experience. There were times when my face hurt from so much smiling. The food was as amazing as the people. I'm so thankful to have the opportunity to attend and thankful to the organizers for their invitation and warm welcome. I’ve always enjoyed my experiences at PyCon US to meet people using Python in places and ways different from my daily use and Python Nordeste gave me a glimpse into a world I’d otherwise never seen. I left feeling more excited and passionate about this community, wanting to share more, and reach more people who all love Python as I do.